Diesel cycle was invented by Rudolph Diesel in 1893. He put forward an idea by which we can attain higher thermal efficiency, with a high compression ratio. All diesel engine works on this cycle. 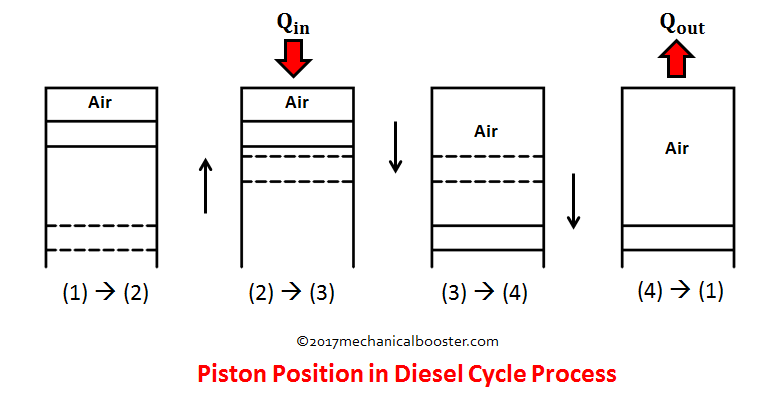 Diesel is used as fuel in this cycle as it can be compressed at higher compression ratio. It is also known as constant pressure cycle because heat is added in it at constant pressure. It has high thermal efficiency and compression ratio (11:1 to 22:1)as compared with Otto cycle. The engine that is put forward by Rudolph consists of an enclosed air in the cylinder. The cylinder walls are perfectly non-conductors of heat, but the bottom is a perfect conductor of heat. It has a hot body, cold body and an insulating cap, which are alternately brought in contact with the cylinder. 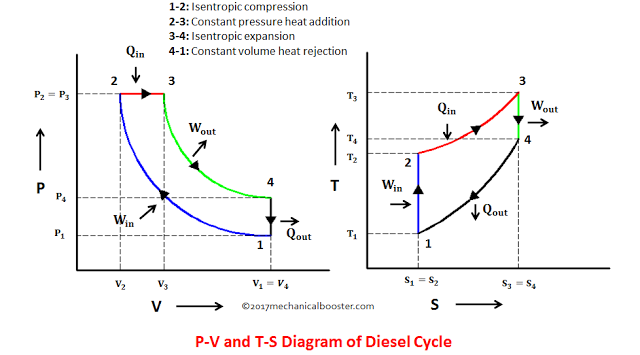 The ideal Diesel cycle consist of 4 process, two isentropic processes, one constant pressure and one constant volume process. 4. Constant volume heat rejection. 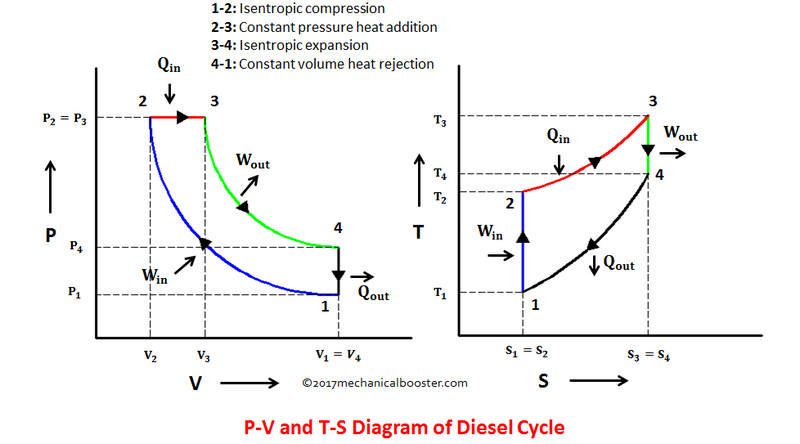 The working of these four processes of Diesel cycle can be easily grasped with the help of P-V and T-S diagram. Note: For better understanding the process, watch the P-V and T-S diagram wherever necessary. In this process the piston moves from BDC to TDC and compression of air takes place isentropically. It means that during compression the entropy remains constant and there is no flow of heat out of the cylinder walls (non-conductors) happens. Here the air is compressed so the pressure increases from P1 to P2, volume decreases from V1 to V2, Temperature increases from T1 to T2 and entropy remains constant ( i.e. S1 = S2). In this process the, the hot body is kept in contact with the cylinder and heat addition to the air takes place at constant pressure. During this process, the piston rest for a moment at TDC. The pressure remains constant (i.e. P2 = P3), volume increases from V2 to V3, temperature increases from T2 to T3, entropy increases from S2 to S3. In this process, after heat addition, the expansion of air takes place isentropically and work is obtained from the system. The piston moves downward during this process and reaches to BDC. The pressure falls from P3 to P4, Volume increases from V3 to V4, temperature falls from T3 to T4 and entropy remains constant (i.e. S3=S4). 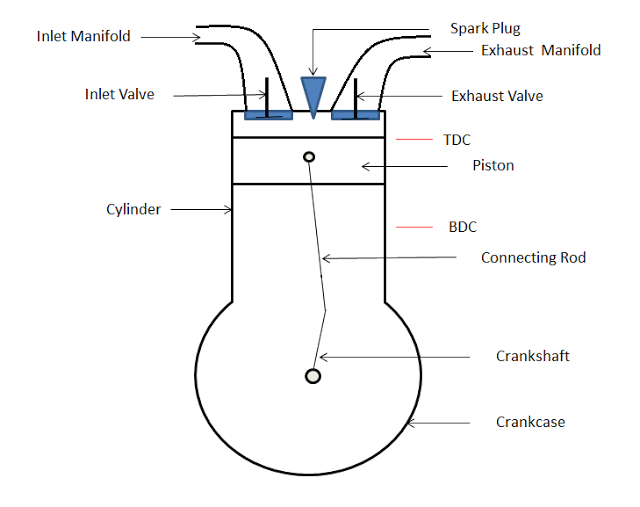 In this process, the piston rest at BDC for a moment and the cold body is brought in contact with the cylinder and the heat rejection takes place at constant volume. The pressure decreases from P4 to P1, temperature decreases from T4 to T1, entropy decreases from S4 to S1 and volume remains constant (i.e.V4 = V1). process. For heat addition diesel is used as fuel which burns and adds heat. In this process, the inlet valve opens and suction of air takes place at atmospheric pressure. It is called as suction stroke. The air sucked is now compressed isentropically. Due to the compression, the temperature of the air increases to such level at which the diesel gets ignites. It is called as compression stroke. At the end of the compression, the piston is at TDC and at this time, the diesel fuel is injected into the cylinder through fuel injector in atomized form. As this atomized diesel fuel comes in contact with the hot compressed air, it gets ignited and combustion process starts. The combustion of fuel adds heats to the engine. The combustion process adds a large amount of heat and this creates a large force on the piston head and it moves downward from TDC to BDC. It is the power stroke. The piston is at BDC and the coolant comes in contact with the cylinder walls and takes away heat from the engine and makes it cool. After that piston moves upward. In this process, the piston moves from BDC to TDC and exhaust valve opens. All the burnt gases left in the cylinder escapes out through exhaust valve. It is the exhaust stroke. 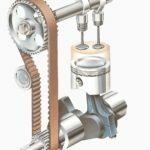 This is how a four stroke compression engine works. At TDC for a moment and moves slightly downward. Heat is rejected to a sink. 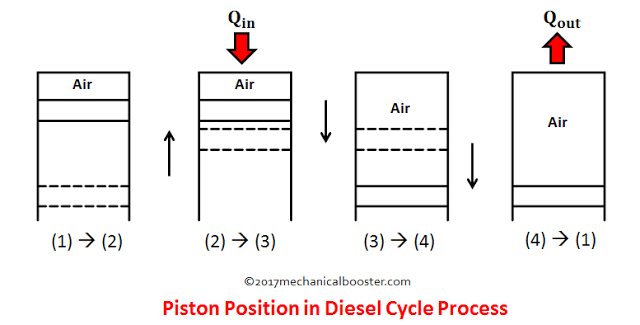 Diesel cycle is used where more power is needed with less amount of fuel. Mainly it is used in two stroke and 4 stroke diesel engines. If you find anything missing or incorrect than lets us know through your valuable comments. And if you found this article informative than don’t forget to comment, like and share. What is Portland Cement and How it is Manufactured? 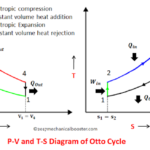 ← What is Otto Cycle – P-V and T-S Diagram Easiest Explanation? 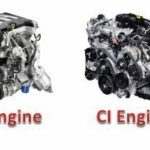 What is Four Stroke Engine?